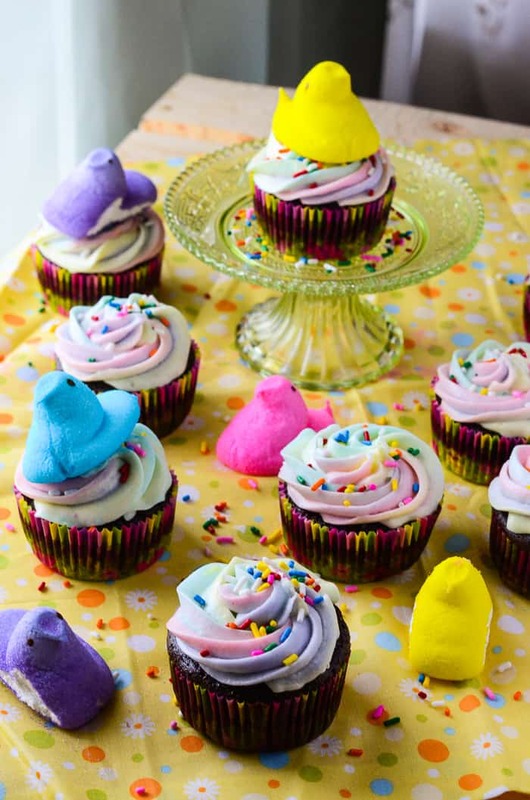 PEEPS® Surprise S’mores Cupcakes?! 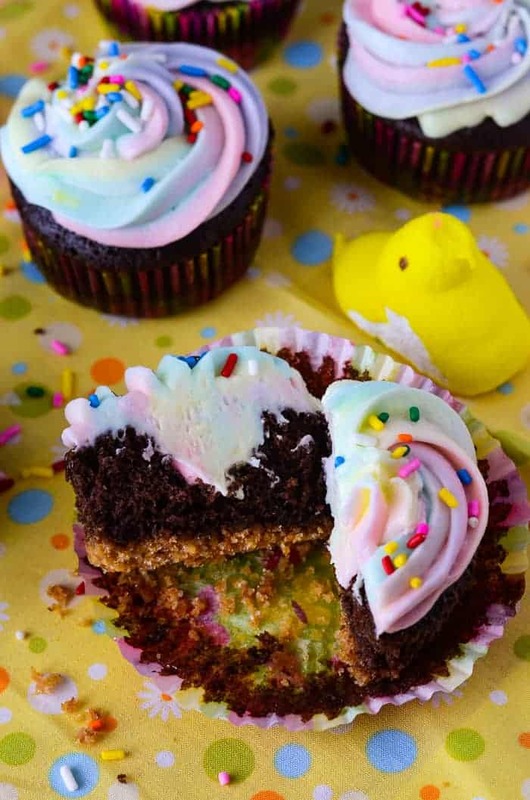 These sweet little chocolate & graham cracker cupcakes contain a secret surprise – they’re filled & iced with PEEPS®! I’m not ready for spring. Don’t give me that look. I know the weather this winter has been horrible. That darn groundhog wasn’t kidding when his shadow scared him back in the ground – it’s been a pretty bad six weeks, and coming from a Floridian like me, that’s something. We may not have had feet of snow, or icy roads, or generally miserable living conditions, but I’ve barely gotten to wear my flip flops this year, and there’s a problem with that. All kidding aside, I personally enjoy winter quite a bit (I know, I’m nuts), and while I may not be ready for 90+ degree weather again, I can safely say these PEEPS® Surprise S’mores Cupcakes might help me adjust a little easier. JUST TAKE ME TO THE PEEPS SURPRISE S’MORES CUPCAKES ALREADY! If you’d rather skip my (pretty darn helpful) tips and tricks, essential cooking info, and similar recipe ideas – and get straight to this deliciously easy s’more cupcake recipe, just scroll right on down to the bottom of the page where you can find the printable recipe card! When I think of spring, I think of flowers and sunshine and cute little fluffy baby animals. New life. A refreshed earth, emerging from it’s chilly hibernation. I don’t really think of s’mores, which I feel are more of a late summer/early autumn camping type treat; and yet, that’s what I’m serving up for you today. Rich, chocolaty goodness, birthed from a simple, store-bought box of cake mix. I’ve said before that I rarely use cake mix, but I feel it has it’s place in the kitchen, and when life throws unexpected events at you, you have to make do with quick solutions, right? Of course, I wasn’t going to follow the script on the box, oh no. This box mix deserved to taste like homemade, even though I was skipping the sorting and sifting. And so, my favorite cast of characters took the stage: espresso powder, vanilla extract, melted butter, and sour cream. Espresso powder (and hot water), to elevate the richness and depth of the settled cocoa; vanilla, to enhance the sweetness of the cake. Butter, in place of vegetable oil, because it just tastes better, and sour cream (and an extra egg) for a nice fluffy, tender crumb. I might use box mix every now and then, but that doesn’t mean I play by the rules. So. You want to know the “surprise”, I suppose. It’s actually pretty straightforward. You can’t tell until you unwrap the little devils, but the cupcake sits on top of a slightly crunchy graham cracker crust. OH, THE HUMANITY. THE SECRET IS PEEPS®!!! 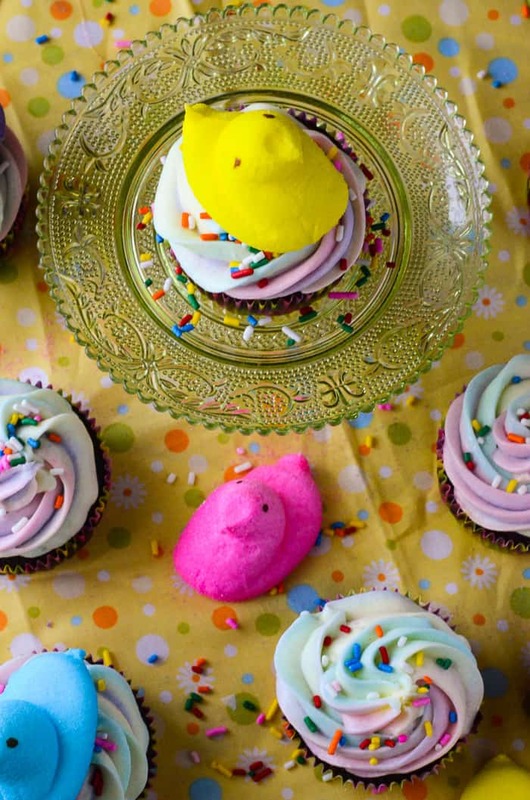 No PEEPS® were harmed in the making of these cupcakes. They were simply re-purposed. Honest! They practically jumped in my double boiler. They didn’t go down without a fight, either. It was a messy endeavor, but the results were well worth it. A small word of caution: these babies aren’t for the fainthearted. If you were never a fan of PEEPS® in your Easter basket as a kid, you probably will love the cupcake, but won’t care much for the icing. To that, I say – use less icing! It’s a standard buttercream, which is already sweet, and then you add over a half pound of more melted sugar (hello, diabetes). They’re so worth eating, even if it’s with a tiny swipe of icing on the top. But for you sugarholics out there, I guarantee you’ll love them. And so will every kid you know! 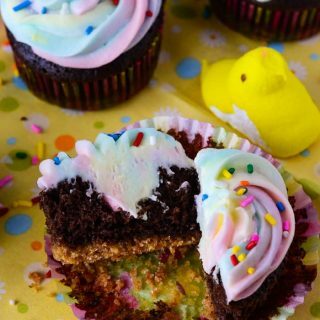 These sweet little chocolate & graham cracker cupcakes contain a secret surprise - they're filled & iced with PEEPS®! Preheat oven to 350 degrees F. Line 2 standard cupcake pans with liners and set aside. Combine ingredients in a small bowl and mix until combined, and small clumps form. Divide mixture evenly between cupcake liners, about 1 Tablespoon per liner. Pack it down firmly with the bottom of a small glass. Bake 5 minutes, them remove to cool. In a large bowl, combine dry cake mix and espresso powder. Add remaining ingredients and whisk for 2-3 minutes, until batter is combined and uniform. Be careful not to over mix. Using a large ice cream scoop, add batter on top of graham cracker crust, filling cupcake liners about ¾ of the way full. If desired, sprinkle more graham cracker crumbs on top of each cupcake, then place pans in oven. Drop oven temperature to 325 degrees and bake for 20-25 minutes, or until a toothpick inserted in the center comes out clean. Remove from oven and allow to cool in pans for 5 minutes, then remove and place on cooling rack. When cool, using a paring knife, cut a small, 1-inch deep cone of cake out of the center of each cupcake. Set aside. In the bowl of a stand mixer with a paddle attachment, beat butter 3-4 minutes until creamy. Add in the confectioner's sugar slowly, about ½ cup at a time, until smooth. Taste after each addition to gauge how sweet you want it. Remember, you'll be adding melted sugar-covered marshmallows to this! Add salt and milk, beating on low until incorporated, then on high for 2-3 minutes until fluffy. 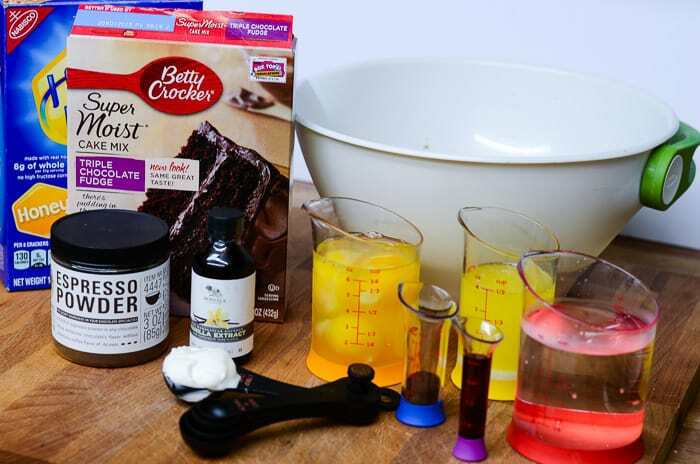 If you're making multiple colors, divide your buttercream into separate bowls. In a double boiler (or a metal bowl set over a pot of boiling water - be careful with this! 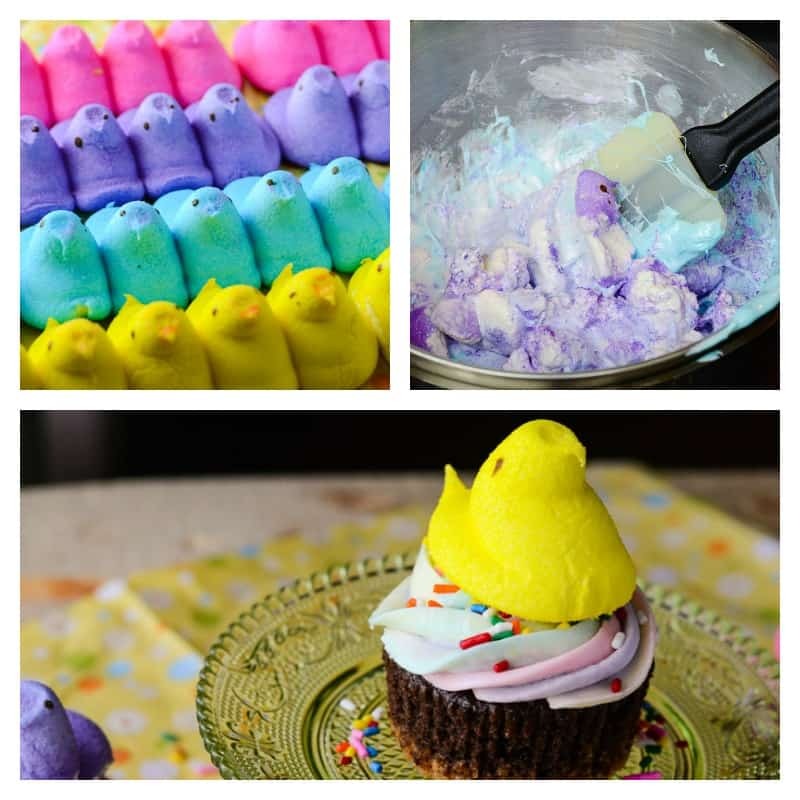 ), melt your PEEPS®, using a silicone spatula to help the process. I used 4 colors, and melted each color separately, but you may only use one color if you're looking for an easier time. Working quickly, add your melted PEEPS® to a bowl of buttercream, and mix with a spatula until fully incorporated and smooth. If only making one color, simply add all of the melted PEEPS® in to your stand mixer and beat on medium-high speed until incorporated. Fill a piping bag with your icings, striping each color separately inside to achieve a variegated color. Pipe a small amount of icing inside the cut out cupcake centers, and proceed to frost each cupcake, re-striping the bag with your colored icing each time you fill it. The result is unpredictable and so spring-like! 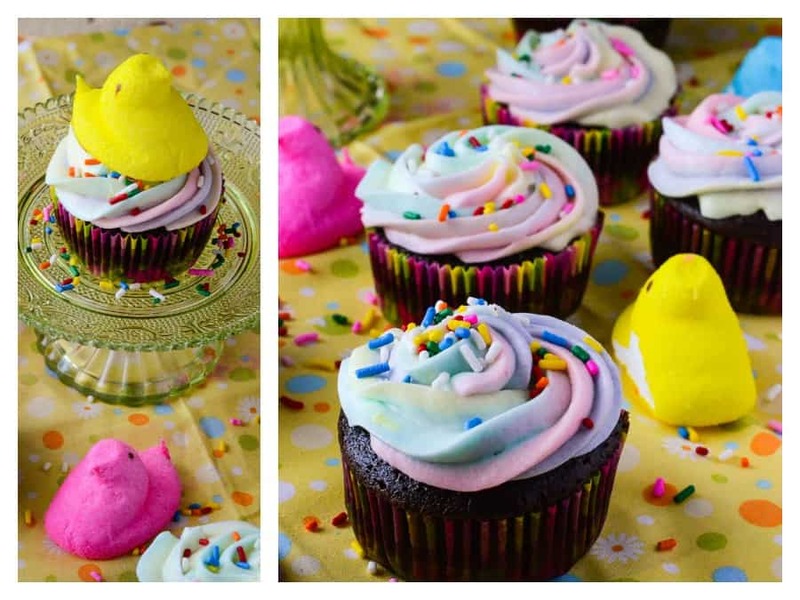 Decorate with sprinkles and full-sized PEEPS®, and enjoy! Looking for a little more PEEPS® stuff to love? You can visit PEEPS® on Facebook, Twitter, Instagram, and Pinterest! Don’t forget check out their website for more ideas and recipes, too! I’m such a loyalist, I stick with the yellow ones too…although, blue is my favorite color, so they take second place! My favorite peeps is the pink colored peeps chicks. Yummy!! Girl, I totally feel you on this winter being depressing but not necessarily being ready for 90+ degree days. Our weather has been all over the place, and it’s driving me crazy. Add in the fact that I’m officially 41 weeks pregnant, and I’m just OVER IT. 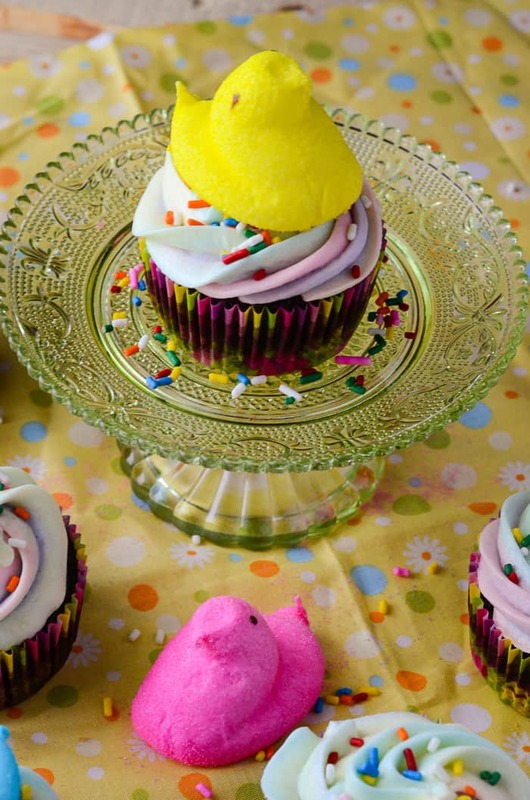 That being said, I want to eat the entire batch of these cupcakes, and Peeps were never my favorite Easter candy. However, I’m totally willing to give them a try because they’re so darn cute! One of these days, you’re going to teach me how to make pretty cupcakes! Let’s make it happen, girl… though now I now am cooped up in the house with a baby. 😉 We’re so excited that she’s here, and I cannot wait to learn your icing techniques. Or try these gorgeous cupcakes. Mmm. My favorite Peeps is the PEEPS Dark Chocolate Covered Marshmallow Chicks. My favorite is the new strawberry flavored peeps. I haven’t tried those yet! I got the mystery ones, and the cake batter ones, and they’re both pretty good! I think the mystery is green apple, personally! These not only look delicious, but they are SO cute! They are perfect for Easter day! I LOVE this idea! No one in my family enjoys peeps but they may like that icing! And the overall cuteness is just precious! Great post! Oh my gosh, how adorable are those cupcakes? I actually love PEEPS, so I’m sure these would be a winner in our house! I am absolutely obsessed with cupcakes so these are perfect for me this time of year! And what a fun giveaway! 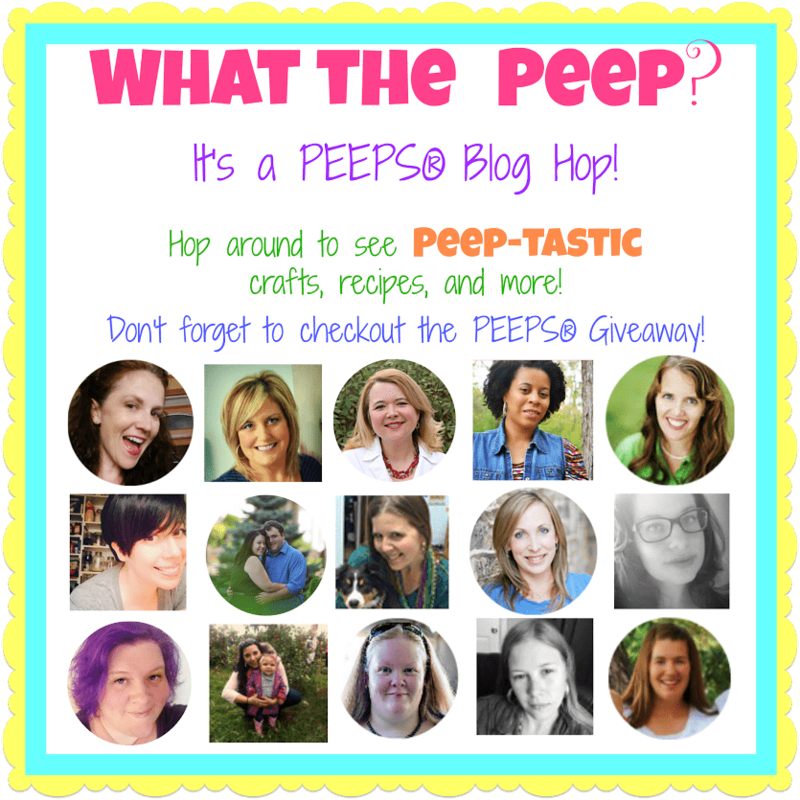 @peepsandcompany really pitched in a great basket for our giveaway, didn’t they?! Good luck! These look amazing and delicious and fun and easy and…will have to try them. thanks for the share! Nothing says easter basket to me like Peeps! I have to admit I am not a Peeps fan, but my kids love them! 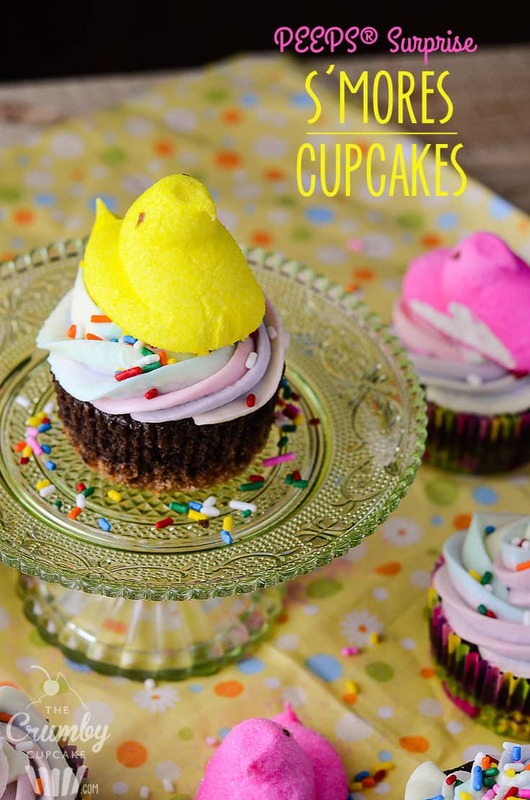 These are the cutest cupcakes I have seen in awhile, and I look forward to making these with my kids over the Easter break. They look delicious! Thank you so much, Kirsten! They’re definitely a fun kitchen project, and the end results are yummy! Hope you and the kids all have a great time, let me know how they turn out! wow. smores are like one of my favorite things in the world. and so are cupcakes. do you think of all these recipes yourself? im a new follower so idk… i make cupcakes all the time and would totally post but theyre not my own recipes. is that ok to do? Cupcakes are definitely my thing! 🙂 I often get inspired by things I see in cookbooks, magazines, on TV, on Pinterest, and on other food blogs, and yes, usually my recipes are my own. BUT, if I ever use anyone else’s recipe as a base, or adapt it to use in my own creation, I always give credit to the original author in the recipe notes or the blog post itself. That’s really all you need to do. If you wanted to go the extra mile and contact a fellow blogger to ask permission to use/adapt their recipe, you could, but it really isn’t necessary. 🙂 Honestly, it’s flattering to see someone else successfully recreate your recipe! I think I’ve had Peeps once as an adult and I couldn’t stand them. My mom wouldn’t let me have them as a child but if they had been in this? I think I would have been a bit rebellious. Oh my goodness, I still love them! In moderation, of course – can’t eat too many without feeling a little green, lol. I’d be all over these if they were vegan. But they look cute though! I haven’t eaten a PEEPS in years! Love ho you made the PEEPS frosting. So clever and pretty! Love this idea! Your pictures are amazing and I’m sure the cupcakes are too. Love that little crystal plate! These cupcakes look Ahh-mazze-ing. I love Peeps and always look forward to enjoying them during the holidays. Peeps make for the cutest desserts! I just knew you would approve, Krystal! 🙂 Thank you, doll! I like the chocolate covered PEEPS! How pretty are these! Oh Peeps, they make me think of when I was little on a sugar rush with sticky fingers, hah.